This month I am recommending a text book of sorts. 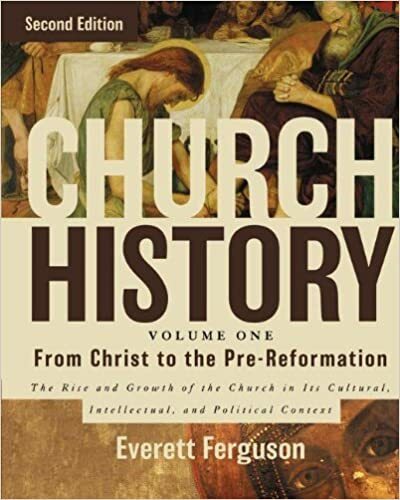 I would like to recommend Church History Volume One: From Christ to Pre-Reformation the Rise and Growth of the Church in its Cultural, Intellectual, and Political Context by Everett Ferguson. With a title like that, encompassing so many years of church history, one might expect a book of ginormous proportions, only this book is just over 500 pages. Where Church History draws its strength is the breadth of topics it covers, but this is also its weakness. Ferguson does not mine the depths of any topic in this history book, but there is enough to pique the interest of a reader to seek further knowledge on the many topics he lightly touches on. I suggest this book because of the exposure to the early church as it encountered heresies and schisms and the results and impact they had on the faith. Many of the traditions that are still impacting Christianity have their roots in these events. This alone makes the book worth reading and discovering the rich history of Christianity with its warts and roses. I also suggest this book for the names and topics that are vastly interesting to an individual seeking knowledge of the history of Christianity as a marker for further research and study. This is a church history 101 type book that will definitely not make a person highly knowledgeable about any one topic, but the general arc of history over a 1,500 year time span can be gleaned. I would guess most people have never heard of the majority of the topics covered in Ferguson’s book because the modern U.S. education system does not touch on this history. With this suggestion, I also provide this warning, this book does not an expert make, but it could make some fools. Please consider purchasing the book from the link below to support Catalyst Baptist Church, without impacting your price.